I chose to use the Standard edition of Track-It! 5.0, which is Blue Ocean's most recent release of their help desk and asset management application. I was very excited about getting Track-It! up and going because I had heard good things about it, mainly from an engineer and manager who had used it in a company that built and supported custom computer systems. Coming from a background that was strictly 8-to-5 phone and e-mail support for software, I was anxious to see how Track-It! would fit into my support department. The first thing I noticed about Track-It!, after the very smooth installation, was that it just looked and felt great. It was the leather upholstery and heads-up dash that drew me in. I was so busy being enchanted with the color-coordinated client and Web application (which is automatically installed, unlike some applications), that I almost forgot to look at the features of the product, which were plentiful. First, because it is an asset tracking application first and foremost, Track-It! begins with an inventory of the workstations that are to be tracked within the organization (this is similar to NetSupport TCO, also covered in this roundup). An add-on called Track-It! 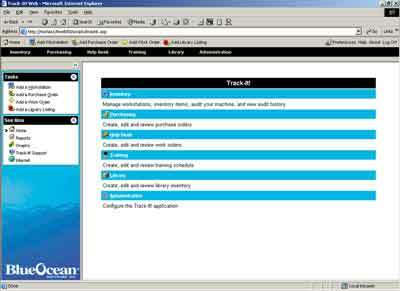 Remote allows remote control access to the workstations; licenses have to be purchased separately. After the workstations are set up, technicians can be added. One of the things that I really like about Track-It! is its ability to customize the application layout, such as colors, and also the data itself. By providing user-defined fields throughout each section and a thorough reporting mechanism, Track-It! is able to immediately extend its functionality. Two other features that might benefit a help desk environment—especially one like mine, where the support department often catches many internal tasks—are Purchasing and Training. Purchase orders can be added directly into the application, and the ability to add and report on any piece of information pertinent to a vendor makes follow-up calls and e-mails, when equipment is backordered, so much faster. The training feature is designed to create and assign training courses for technicians and other employees. In a technical environment with certification and training material costs, having this information ready for reporting would be ideal for a support department manager; so, too, would the Library feature, which allows the tracking of loans of assets, such as laptops and handheld units. All in all, Track-It! is a great looking product that provides Web capabilities out of the box and several standard features that help desk technicians can put to immediate use. It is well documented and straightforward so the learning curve is almost non-existent. Track-It! impressed me with its attention to some of the tasks that a help desk environment can often be involved in but rarely recognize as such, like ordering of equipment. In future releases, I can imagine seeing some level of project management that would bridge the gap between the standard work order and the company's other asset—the engineer's time.